Home vs studio: where to practice yoga? I’ve been practising yoga asana for two and a half years now, but I’ve only practiced in a studio for about seven months of that time. Would I be more ‘advanced’ if I’d attended a studio from the beginning? Maybe. But here’s the thing. Without starting by following YouTube videos, chances are I never would have started practicing yoga at all. You see, yoga wasn’t even on my radar. I didn’t wake up one day and think, “I’ll start practicing yoga today”. I was a runner and had started incorporating cross-training activities such as swimming, cycling and weight-training. I ‘wanted to be thin’ like 95% of all females ever, and I was obsessed with Pinterest at the time. I was looking for workouts that would give me the “toned abs” that everybody seemed to be seeking, when I came across a 31-day strength program. It took me a while to even realise it was yoga. I felt drawn to it, but my evenings were already taken up with other training commitments, so I set my alarm for 6am the next morning to start. And as they say, the rest is history. That was the same reason I started running. However, unlike running, I could do this in the comfort of my own home. Simply put, it was accessible. I was practicing before my husband woke up every day, still dark outside in late March. The world was asleep and I wasn’t comparing myself to anyone else, I wasn’t worrying about how I looked, I didn’t care how sweaty I was or anything really at all. I could just practice. The beauty of YouTube videos is you can pause them, rewind them etc. I could give myself as much time as I needed to play around with something; I could practice the same thing over and over. Even now, I’ll see something on Instagram or think up some transition in my head and just start playing around in my living room. Okay, I guess technically you can do that with studio classes too, but I don’t have to worry about there not being space in my favourite class, or having to carry yoga clothes to work with me, factoring in commuting time or not finding a class I like at a time that suits. I can just go home, dump my stuff, change my clothes, and yoga. A lot of people talk about being too nervous to go to a studio class, and I didn’t get it at first. I then realised, by the time I actually went to my first studio class, I had already been practicing for almost a year and a half! I knew what the poses were that they were calling out, I knew what to do when I was told to ‘move through my vinyasa’ and I already had internalised many of the alignment cues. I had practice flowing, I could already do a lot of the poses and was at the stage in my practice where I was confident enough to try in public the ones I couldn’t. I was also sure enough in my practice to understand how and when to modify poses, I knew what to do if I wanted a slower practice, if I wanted to be challenged, or if I was injured. In truth, the only reason I started attending studio classes was because I had signed up to yoga teacher training and I knew it would be beneficial for me to actually go to classes if I wanted to start teaching them, get used to the studios, introduce myself to the teachers, try different types of yoga and expose myself to as many different teaching styles as I could. To be perfectly honest, I wasn’t expecting much. What could possibly be better than my trusty home practice I had been developing all this time? To clarify, adjustments tend to be gentle hands-on or energetic alignment corrections from the teacher. Assists tend to be more involved and are often to help the student get deeper into the pose. When I first started going to classes, it was mainly just adjustments I received; only one or two, but I never forgot them and every single time I get into these poses, they are in my mind. As I became a regular at some of the classes and the teachers got to know me and my practice, I received more assists which were just heavenly – they feel incredible. When we were at training I was the first to volunteer to be the demo student for all assists – they are a dream. When you are at home and you are at the stage where you are playing with your own self-practice rather than following videos, it can be a bit too easy to not hold the pose as long, miss out a warm up, cut the practice short because *life* or just lack inspiration altogether. In a studio class, you hold the pose until the teacher tells you to stop or your body does. You commit to the whole hour or hour and a half and don’t leave your mat until class is finished. And in this life where we have to make a million decisions a minute – you don’t have to think! You just do what you’re told and switch your mind off. In a studio, you really feed off the energy of the other students and of the teacher. If you’ve been to a studio class, you may have experienced the phenomenon of hitting a pose you thought was not in your practice yet, only to go home and never be able to recreate it. I can’t say for sure why that happens, but I think the encouragement of the teacher and the energy of the room have something to do with it. You get wrapped up in the whole immersive experience with the music, the teacher’s voice, the interaction with the students and any of the special touches which that specific teacher offers. It really is a unique experience and one I look forward to every time I sign up for a class. Like with any group activity, going to a class can be a great opportunity to meet new people. Especially if you become a regular, you form relationships with the students and the teachers. And the more the teachers get to know you and where you are in your practice, the more they challenge you and get you to try things you perhaps thought you couldn’t do. Again, you can get some of this from following YouTube videos, but I know I only followed YogaByCandace and didn’t branch out at all (to be clear I love her teaching style, that’s why I signed up for her training!). Going to different classes, you get inspired by their playlist, their quotes/readings, their flows and if you are a teacher or thinking about becoming one, they’re invaluable. You get inspired by how they structure their classes, how they cue, their assists and adjusts and the million other things I’ve recently come to learn you have to think about! The aim here is not to tell you that one way is better than the other, or that you even need to choose one over the other. I love blending the two, practicing something which was introduced in class at home, or playing with something I’ve been working on at home in class when they’ve given us a few minutes to try something out. Also, like with everything in life, this is something which evolves. Don’t become too attached to one or the other. 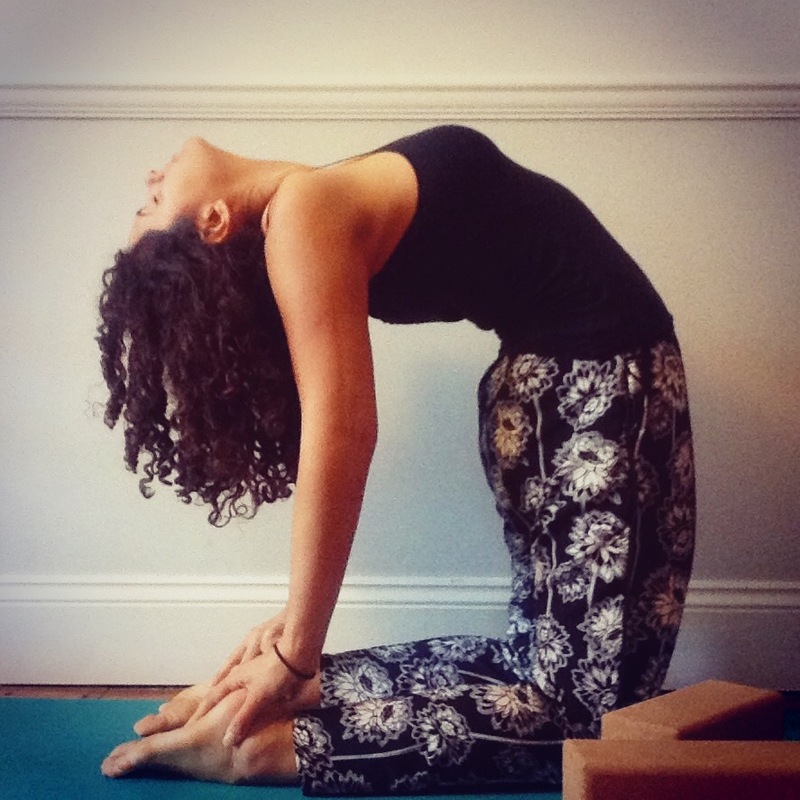 The whole point of this post is to share what I’ve found having tried both home practice and studio practice for anyone who thinks they might want to start yoga but aren’t sure which way would suit them best. For me, I’m glad it happened the way around that it did, establishing a home practice before going to a studio. By the time I went to my first class I felt confident and could just enjoy the experience of the things I couldn’t get at home (e.g. a hot yoga studio) and become familiar with this type of environment before I started teaching myself. However, everyone is different. Maybe you want to start by going to class. Maybe you’re anxious about a group setting but want the help of a qualified teacher, and a private session is the way to go. If money is an issue, maybe you want to start with some videos at home. Really there is no right answer - the best option is whichever one makes you start. Do that.